You are currently browsing the category archive for the ‘fish’ category. Having married into a New England family, I know to leave chowdah to the experts. But an opportunity presented itself in the form of 22 lbs of sockeye salmon, sustainably harvested out of Bristol Bay, Alaska, and now tucked away in our freezer thanks to a neighborhood purchasing co-op. Unless you’ve been charged with feeding a small army, this situation calls for fast diversification of your recipe portfolio. A recent cooking problem went like this: leftover roast salmon, rapidly aging corn on the cob, wrinkly potatoes. 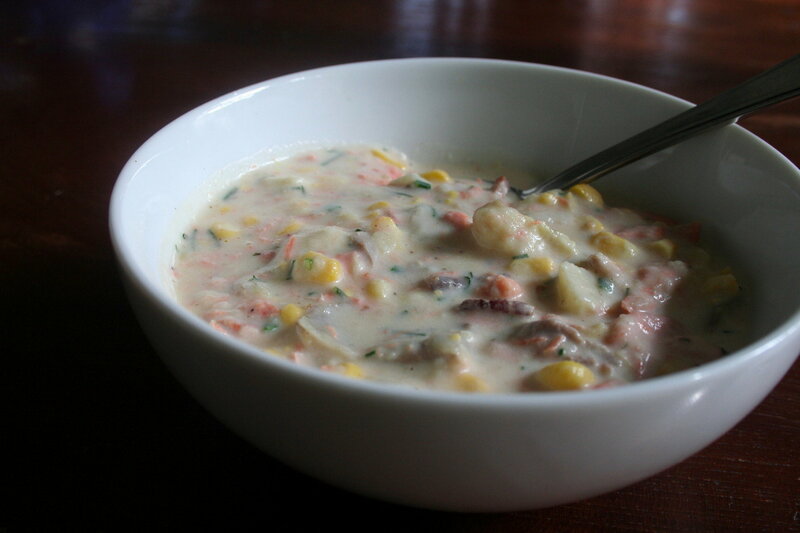 I floated the chowder idea to the husband, who pointedly refuses foods such as lobstah when prepared so far from home. But he didn’t immediately nix the plan, and this creamy, herby chowder was the delicious result. Bonus, it was a hit with the Biscuit, who has also diversified her portfolio of late. Heat a heavy stockpot over medium-high heat. Render bacon until just crisp, then remove bacon to a paper towel. Pour out all but 1 tbls bacon fat from pot. Turn heat down to medium and add diced potatoes, garlic, and shallots, and cook, stirring, until flavors are released, about 4 minutes. Add clam juice if using, 3 cups water, and corn cobs if available, plus bay leaf, thyme, hot pepper, and 1/2 tsp salt and bring to a boil. Turn down heat and cook on low until potatoes are tender, about 12 minutes. Remove corn cobs and squeeze juices back into the pot. Add cream and salmon and cook gently for 5 minutes on medium low heat. Don’t let the liquid boil. Add corn kernels and continue at a simmer until salmon is just cooked through, 3-5 minutes more. Thin chowder to desired consistency with whole milk, if you wish. Remove bay leaf. Stir in dill, chives, and lemon juice, add salt and pepper to taste, and serve immediately. Feeds 4. Serve with crusty bread and a salad. Fish are a big part of our year-round effort to eat locally so when the Alaska Department of Fish and Game announced an emergency personal-use dipnet opening for Fish Creek, a small waterway just outside of Wasilla, I scrambled to get some gear together. The creek, 26 miles from our house, hadn’t been open for fishing since 1994. Though I’ve covered dipnet fisheries in the past, it was my first time as a participant. 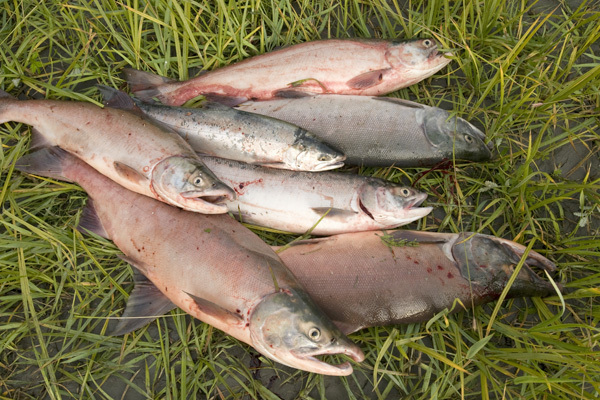 The limit in Cook Inlet is seasonal and based on the size of your household. The family head is allotted 25 fish, with 10 for each additional family member, which meant we could take up to 55 fish (permits are only issued to Alaska residents). Other rivers require different techniques, but dipnetting at Fish Creek is simple: stand on the bank with your net in the water and wait for a fish to run into it. Haul out fish. Repeat. It’s also wildly popular. Hundreds of people turned out each day, giving the banks a festival atmosphere. It didn’t seem possible that any fish would be able to make it upstream with so many nets in the water but they did. In about four hours over three days we hauled in 17 sockeye salmon. With the halibut and silver salmon we’ve already put up, that’s enough to get us through the winter. My old friend was back in town, delivering a high-profile talk at a scientific meeting. We’d been roommates way back when, before she moved on to pursue bigger fish in bigger ponds. Now she waxed nostalgic and talked about moving home for good. The time was right to take advantage of her vulnerability, to ply her with the sort of food that reminds a gal where her heart really lies. So we cooked up a big dinner with loads of herbs like we used to do, but using upgraded ingredients. The offerings included trap-caught Alaskan cod, eaten with thin slices of lardo and a tangy herb salad. We ate chard braised with cilantro, rich polenta that oozed sweet marjoram. 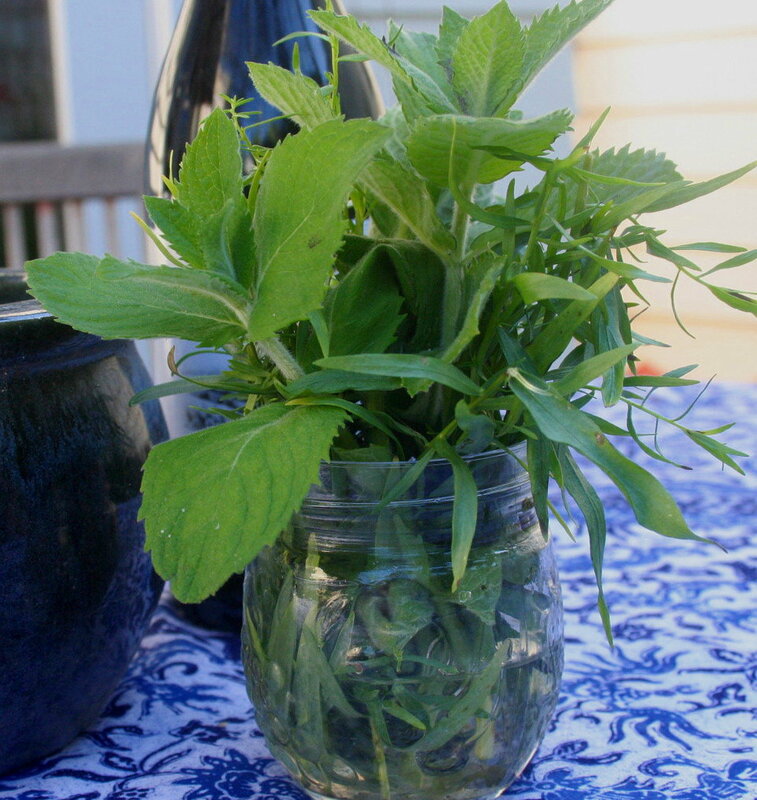 With herbs this time of year, it’s just a matter of reaching into the garden and swiping what looks good. Thirty minutes in advance, rinse shallot slices in cold water, drain, then add vinegar and toss. Rinse fish and pat dry, then gently rub in 3 tbs of olive oil and sprinkle with salt and pepper. Set aside. 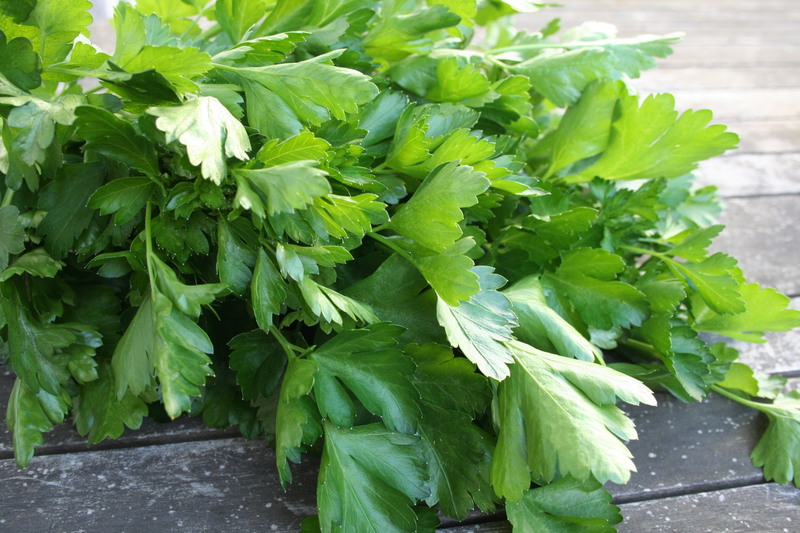 When shallot has mellowed, finely chop mint, tarragon, and sorrel leaves. Combine chopped herbs with chives and lemon zest. Heat oil or render half of shaved lardo in a heavy skillet over high heat. When the pan is hot, add fish and cook until flesh just flakes, about 3 minutes per side, then remove from pan. Turn heat down and cook remaining lardo slices until just brown and crisp, about 3 minutes. Toss herb leaves with shallots, adding additional olive oil, salt, and pepper to taste. Place crisped lardo atop fish, then cover generously with herb salad. Serve immediately. Feeds 4. Adapted from Jerry Traunfeld. At the conclusion of our mostly-local meal, Stephen was all too happy to part with his salmon in trade for pork chops. The fish was a good deal for us, too, even if it’s so plentiful up north that this grade of stuff sometimes goes to the dogs. What they brought us was a glorious wild pink-orange color, with a lush taste. I had a field day thinking of how to use it all — there were the eggs scrambled with salmon pate (and sorrel puree on the side), the salmon cakes done with red curry. I saved the last of it for handmade ravioli but couldn’t make it happen, so I opted to freeze the last chunk. If only salmon were so plentiful here, I’d have happily left it to the dogs. Rinse fish under cold running water and pat dry. Debone and remove any remaining skin. Mix salt and sugars and pour half onto a generously-sized piece of plastic wrap, in a shape that approximates your cut of salmon. Place fish over the mixture and spread remainder of salt and sugar on top side. Sprinkle with Pernod and fennel seeds and several grindings of pepper. Wrap tightly and place between two heavy plates or other heavy flat objects. Refrigerate and flip the entire thing at 24 hours. It is done when the fish flesh is firm throughout, usually 48 hours but up to 72 hours. When done, rinse off seasonings and slice thinly when before serving. Lasts two weeks wrapped and refrigerated. Adapted from Michael Ruhlman.